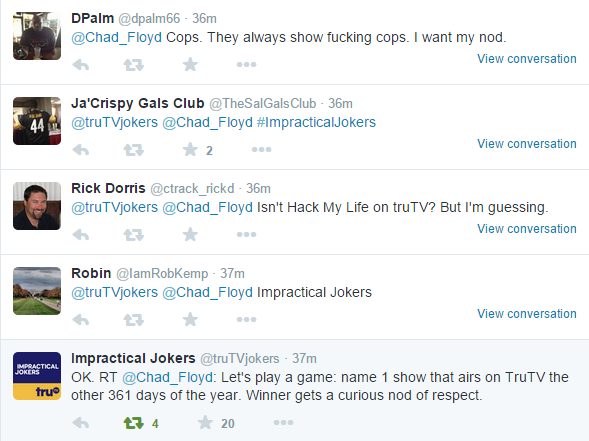 It has further been said that an innocuous tweet from someone with a limited following, upon questioning the existence of TruTV, is the butterfly flutter that sends its fanbase out in droves. I GOT GOT! But I will definitely give the program a shot. I feel like I’m obligated now, and I kinda enjoyed Punk’d for maybe two episodes before Ashton Kutcher inevitably annoyed me senseless. 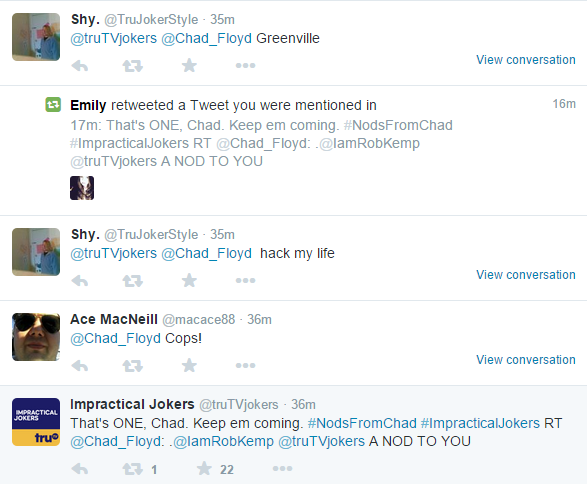 Unfortunately, they also started the hashtag #nodsfromChad, as I am obligated to give curious nods of respect to those who can name a show on TruTV. Embedding this many tweets would cause a carpal-tunnel related loss of productivity at the age of 27, so please accept one mass nod with a LOT of screencaps to follow. And the chaos that ensued. 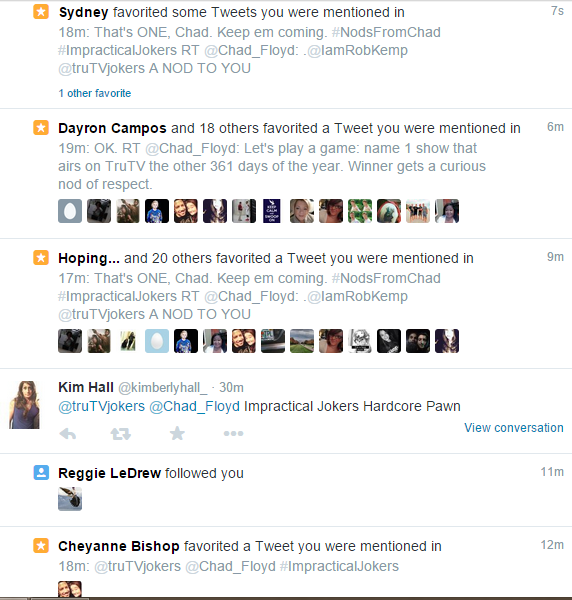 Sweet heavenly mercy, TruTV people. Well played. Oh, and since TruTV is part of the media conglomerate that is paying the NCAA $11 BILLION for broadcast rights over the life of their 14-year contract, your daily reminder: #deathtotheNCAA. A colleague using the only choice language on the whole correspondence. 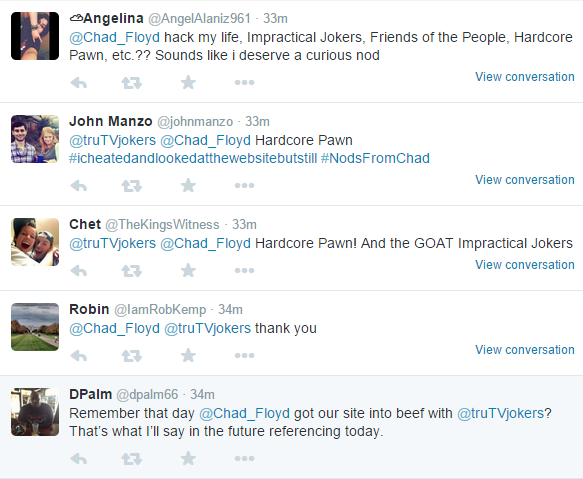 Shy, aka @TruJokerStyle, is the first TruTV loyalist to stand up. Daniel keeps throwing shade. SHY. Get at me. Is Greenville, by any chance, about the city in NC, SC, or GA? If so, COUNT ME IN. Impractical Jokers doesn’t realize how fickle the DYC columnists’ followings are, and individualized nods will ruin my following like Hall’s Pretty Little Liars tweets. Ja’Crispy Gals Club, you are correct. Shy confirms my suspicions. My buddy John chimes in, and then tries to explain to a group text consisting of old friends who don’t use Twitter what is going on. It doesn’t end well. 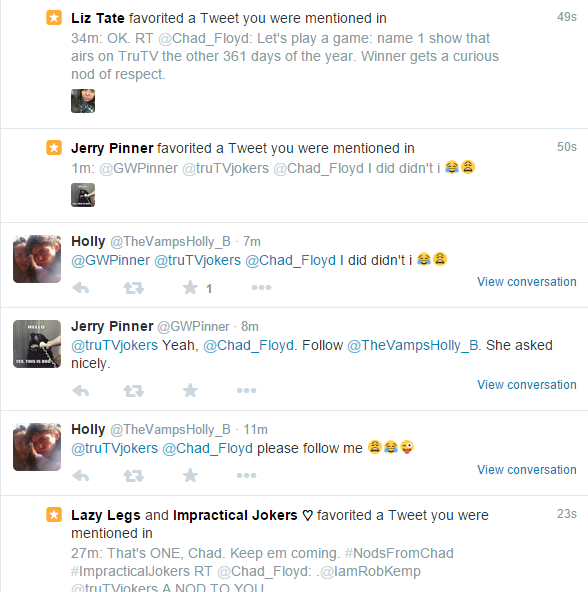 After initial publication, I chose to follow @TheVampsHolly_B and @truTVJokers. Don’t let me down. 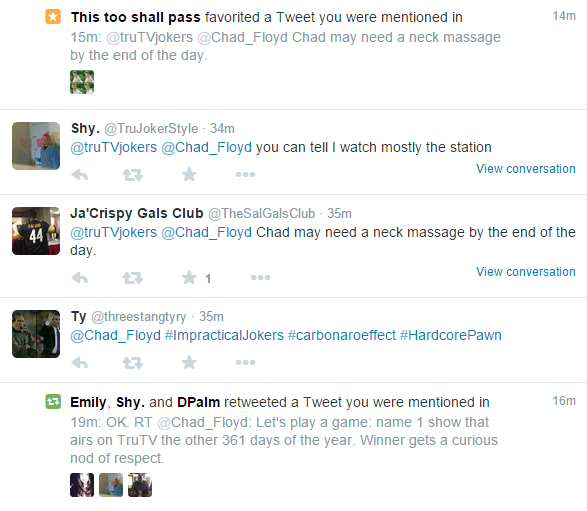 And lead it to clever guy @ChuckScalies to bring it full circle. 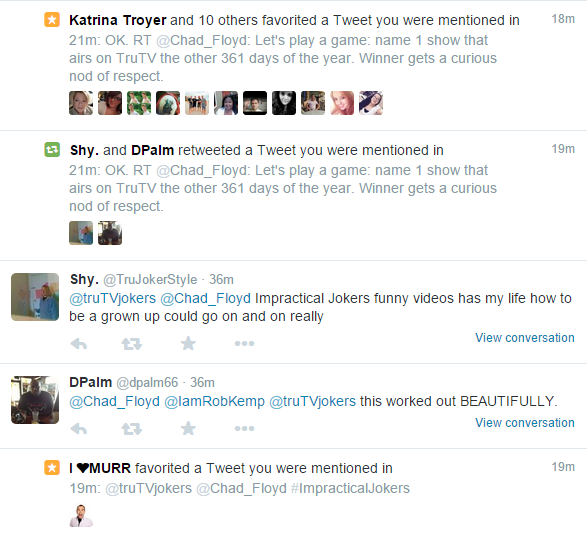 Carry on and prosper, TruTV. I’ll sleep with one eye open. Posted on March 17, 2015, in Death to the NCAA. Bookmark the permalink. 2 Comments. Who cares about Basketball Georgia has the worst basketball program in major collage competition and has for over 30 years. What a joke we are!